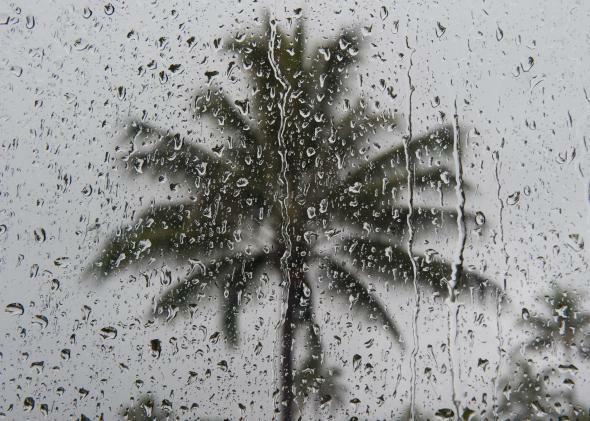 Hurricane Iselle, Tropical Storm Julio to douse Hawaii. Hawaii is going to get drenched this week. Typically tranquil Hawaii is in for an outsized share of weather chaos later this week as two tropical systems seem poised for close approaches. The first, Hurricane Iselle, is currently as powerful as the strongest storm ever to make landfall in Hawaii: 1992’s Iniki, which hit Kauai hard. Iselle should arrive on Thursday or Friday, according to the National Hurricane Center. The next one, Tropical Storm Julio, could follow on roughly the same path just two or three days later, though its track and strength are more uncertain. Julio’s development will likely be limited thanks to the cold water stirred up by Iselle. Both storms are expected to hit Hawaii at roughly tropical storm strength (with sustained winds between 39 and 73 mph) and could bring an extended bout of heavy rainfall that could produce power outages and mudslides. The storms’ arrival coincides with the state’s primary election, to be held on Saturday. Hawaii has seen hurricanes before, but rarely. The islands are relatively protected from strengthening storms by the southernmost fringe of the cold California Current. That current helps to moderate tropical water temperatures, and tropical storms bound for Hawaii from Mexico’s West Coast usually fizzle out prior to arrival. Iselle and Julio should do the same, though are expected to retain enough strength to warrant close attention, thanks in part to those waters currently being warmer than normal. In Hawaii, storms like Iselle and Julio are once-per-decade threats. According to my search of the NOAA hurricane database, only eight storms have made landfall or near-landfall (coming within 20 miles or so) in Hawaii at tropical storm or hurricane strength since 1950. Should Julio follow in Iselle’s path, they’d set a record: Never before have two storms come so close to Hawaii in the same year, let alone the same week. That could happen by Sunday, when Julio is expected to make its closest approach. A recent swing to the positive phase of the Pacific Decadal Oscillation (a cyclical warming of the North Pacific Ocean), plus a simmering El Niño, plus a general push from anthropogenic climate change are making the waters near Hawaii warmer than they otherwise would be this week. 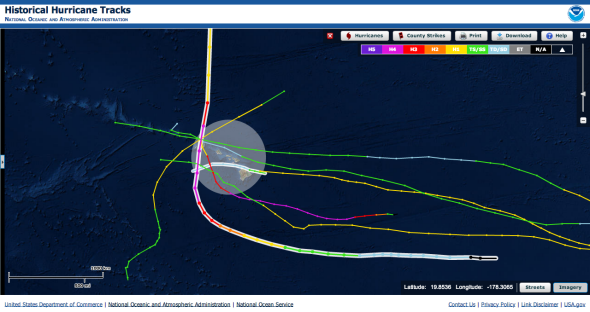 Hawaii’s hurricane history is sparse. Highlighted: Category 4 Hurricane Iniki (1992), which devastated Kauai.